"Henley railway station" redirects here. For the abandoned station proposal, see Sydney Metro (2008 proposal). For the station at Henley-in-Arden, see Henley-in-Arden railway station. * Annual estimated passenger usage based on sales of tickets in stated financial year(s) which end or originate at Henley-on-Thames from Office of Rail and Road statistics. Methodology may vary year on year. Henley-on-Thames railway station is a terminal railway station in the town of Henley-on-Thames in Oxfordshire, England. 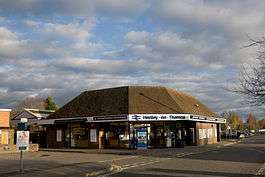 The station is on the Henley-on-Thames branch line that links the towns of Henley and Twyford. It is served by local services operated by Great Western Railway. The station has a single terminal platform, which is long enough to accommodate an eight coach train. There is a station building, with waiting area, ticket office and self-service ticket machines, together with a 280 space car park. The station is manned in the mornings only, on Mondays to Saturdays. The station was opened by the Great Western Railway on 1 June 1857. It had three platforms, mainly to serve the intensive service for Regatta traffic, for which purpose they were lengthened in 1891. The original trainshed and station building, which were to the north of the present station, were removed in 1975 and the site sold. The platforms were reduced to two from 16 March 1969, and then to just one in 1986. The present building was erected in 1985 to serve the one remaining platform. Other facilities at the station included a large goods yard (closed 7 September 1964), which is now the car park, a goods shed, signal box (closed 20 March 1972), engine shed (closed 5 October 1958), and turntable. These were progressively removed in the 1960s and 1970s. To the south of the station lay extensive sidings, used to stable extra trains during the regatta and at other times to store surplus coaches from as far away as Old Oak Common. In normal service, there is a regular service between Henley-on-Thames station and Twyford station, with all trains calling at the intermediate stations of Wargrave and Shiplake. Trains operate every 45 minutes on weekdays, and every hour on weekends. During the morning and evening rush hours some services run through to/from London Paddington station, whilst a few off-peak trains run through to/from Reading station. At other times, passengers for Paddington and Reading must change at Twyford. During the Henley Royal Regatta, held every July, a special timetable is operated with additional trains. During the period of the regatta, not all trains stop at Shiplake and Wargrave. Although the off-peak services use 2 coach trains and the peak time services to and from Paddington are usually no longer than 6 coaches, longer trains are run during the Regatta. 1 2 "Henley-on-Thames (HOT)". National Rail Enquiries. Retrieved 7 May 2015. ↑ "Twyford to Henley-on-Thames" (PDF). First Great Western. 17 May 2015. Retrieved 7 May 2015. ↑ "Henley Royal Regatta". National Rail Enquiries. Retrieved 7 May 2015. MacDermot, E.T. (1927). History of the Great Western Railway. Vol. I (1st ed.). Paddington: Great Western Railway. Mitchell, Vic; Smith, Keith (February 2002). Branch Lines to Henley, Windsor and Marlow. Midhurst: Middleton Press. ISBN 1-901706-77-X. Yonge, John; Padgett, David (August 2010) . Bridge, Mike, ed. Railway Track Diagrams 3: Western (5th ed.). Bradford on Avon: Trackmaps. ISBN 978-0-9549866-6-7.